Beginning with version 4.41.83 you can create custom field templates to help in the definition of custom fields in passwords. Note: if you're new to custom fields in Team Password Manager, please read the following document: Custom fields in passwords. You can create global templates with custom fields that you can use to fill in the custom fields of passwords. For example, you can create a template called "Database server" with the following fields: "IP address", "MySQL root password", "App", "App user", "App password", and "App database". Then, when you create a new password corresponding to a database server you can use this template to automatically fill in its custom fields so that you don't have to manually create them. You can also set a template to be the default template. This way, new passwords will automatically have the custom fields of the template. 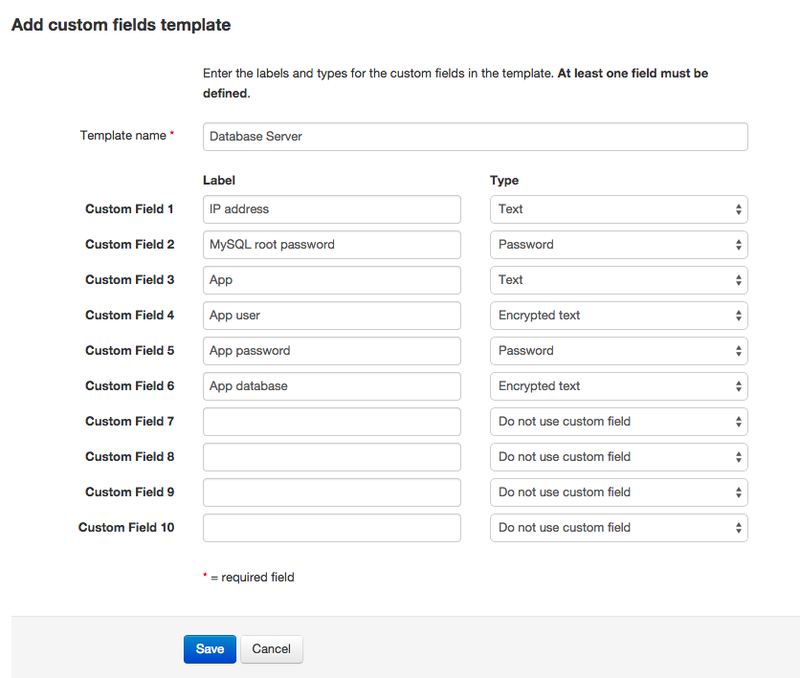 Finally, you can define a custom fields template inside a project. 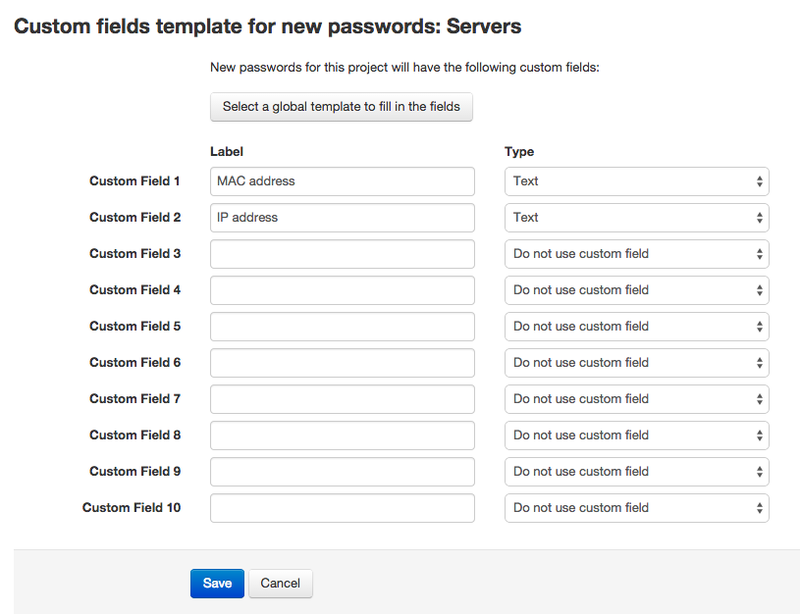 With this, new passwords in this project will automatically have the custom fields defined in the project template. A project template takes precedence over a global default template (if set). Since the templates menu is in "Settings" only users with "Admin" and "IT" role can manage (create, edit, delete, set default) custom field templates. The number of fields and types of the template are the same as in the custom fields definition in passwords. This is obvious since it's a template but we think it's worth noticing. You can set a template as default so that new passwords automatically get the custom fields defined in the template. You can also create a custom fields template in a project. A project can only have one custom fields template and, if it is defined, new passwords created in this project will automatically get the custom fields from its template. Since projects can only have one template, the template doesn't have a name. It's the template of the project. You can use a global template to fill in the fields of the project template (and then change them if you want). To do so click on the "Select a global template to fill in the fields" button and select the template you want. You can change the project template at any time by clicking on the "Select a global template to fill in the fields" button. To delete the template, simply set all the fields to "Do not use custom field". Only the project manager or admins can define a project template. If its project has a custom fields template defined, the custom fields of the project template. If a default global custom fields template is set, the custom fields of the global template. If the project of the password doesn't have a template and no default template is set, the password will get no custom fields, and you'll have to define them manually by clicking on the "Custom fields" button on the password screen. Note that this rule also applies to passwords created via the API. In this screen you'll be able to select a global template or the project template if one is defined for the password's project. 3. Click on "Save" to save the new custom fields definition. If a template is used and field definitions change in a password (different types or labels), no data is changed, but it can be stored with different encryption. For example, if a field was of type "Encrypted text" and now is just "Text", its data will be stored in the clear now. If a a template is used and field definitions get deleted (set to "Do not use custom field"), no data is deleted. If a template changes, the fields in passwords where the template was used don't change. A template definition is disconnected from the custom fields definition of a password where the template is used.